For other uses, see Battle of Mosul (disambiguation). The Fall of Mosul occurred between 4–10 June 2014, when Islamic State of Iraq and the Levant (ISIL) insurgents, led by Abu Abdulrahman al-Bilawi, defeated the Iraqi army, led by Lieutenant General Mahdi Gharawi. In January 2014, ISIL took control of Fallujah and Ramadi, inciting conflict with the Iraqi army. On 4 June, the insurgents began their efforts to capture Mosul. 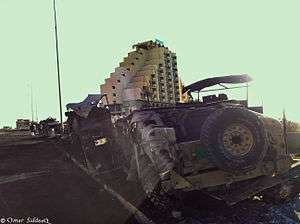 The Iraqi army had 30,000 soldiers stationed in the city, facing a 1,500-member attacking force. However, after six days of fighting, the city, as well as Mosul International Airport and helicopters located there were under ISIL's control. An estimated 500,000 civilians were displaced from the city due to the conflict. Since December 2013, ongoing clashes have occurred between tribal militias, Iraqi security forces, and the Islamic State in Iraq and the Levant (ISIL) throughout western Iraq. In early January 2014, ISIL militants successfully captured the cities of Fallujah and Hīt, bringing much of Anbar Province under their control. The Iraqi Army then began conducting an offensive into Anbar, in an attempt to bring the region back under government control. Iraqi forces recaptured Samarra on 5 June 2014, and also heavily shelled Fallujah to weaken the ISIL forces there. However, ISIL had made territorial advances in neighboring Syria, giving them access to more weapons and substantially strengthening their position. In early June, following the Iraqi Army's campaign in the Anbar region, insurgents began advancing into the central and northern parts of Iraq. During the advancement, Iraqi security forces killed ISIL military chief Abu Abdulrahman al-Bilawi on 4 June near Mosul. ISIL named the military operation that resulted in their seizure of Mosul, "Bilawi Vengeance", a reference to their late commander's alias. Just before the operation began, insurgents still controlled most of Fallujah and Garmah, as well as parts of Haditha, Jurf Al Sakhar, Anah, Qa'im, Abu Ghraib, and several smaller settlements in the Anbar Province. On 4 June, Iraqi police, under the command of Lieutenant General Mahdi Gharawi, cornered ISIL military leader Abu Abdulrahman al-Bilawi in Iraq. Al-Bilawi blew himself up and Gharawi hoped it would prevent an attack. At 02:30 in morning, ISIL convoys of pickup trucks, each truck carrying four fighters, entered Mosul by shooting at the city's checkpoints. Though Mosul's first line of defense was thought to contain 2,500 soldiers, Gharawi says that "reality was closer to 500". He noted that since all of the city's tanks were being used by Iraqi forces in the Anbar province, the city was left with little to combat the ISIL fighters. The insurgents hanged, burned, and crucified some Iraqi soldiers during their attack. ISIL commander Abu Abdulrahman al-Bilawi was killed near Mosul that day. On 5 June, a curfew was imposed in the city. The government used helicopters to bomb the militants. In the southern part of the city, five suicide bombers blasted an arsenal. ISIL began their attack on the northwestern part of the city on 6 June. The ISIL forces in the city totaled 1,500 soldiers, outnumbered by Iraqi forces by 15 to 1. Two suicide bomber cars exploded, in Muwaffakiya, a village near Mosul, killing six Sabak soldiers. After the attacks, most of the fighters either retreated into the desert or camouflaged among the local population. On 8 June, the group launched a double bomb attack against a Patriotic Union of Kurdistan party office in Jalula, in which eighteen people died. That day, about a hundred vehicles entered Mosul, carrying at least four hundred men. Sleeper cells hidden within the city were then activated and according to police, "neighbourhoods rallied to them". Assassinations carried out by the sleeper cells left Mosul leaderless. The group also bombed a police station in the neighborhood of al-Uraybi, and commandeered an abandoned building on the west of Tigris river, transforming it into a headquarters for a group of thirty SWAT members. On 9 June, ISIL executed fifteen Iraqi security force members who were captured in Tikrit. According to CBS News, ISIL fighters armed with machine guns and rocket-propelled grenades stormed the Nineveh provincial headquarters that same day. By that time, the Fourth Battalion were among the very last local police fighting the attackers, the rest of the defense forces having run away or joined the opposition. Lacking plans and ammunition, Gharawi ordered the Iraqi military to retreat on the advice of retired general Khaled al-Obeidi. On that same night, ISIL and Sunni militants attacked Mosul, causing heavy fighting overnight. Iraqi Army soldiers fled the city while it was under attack, allowing the militants to control much of Mosul by midday on 10 June. The militants seized numerous facilities, including Mosul International Airport, which had served as a hub for the U.S. military in the region. Militants captured the helicopters present at the airport, in addition to "several villages" and a military airbase in south Saladin Province. The Iraqi army "crumbled in the face of the militant assault", which is evidenced by the fact that soldiers abandoned their weapons and dressed as civilians to blend in with the noncombatants. 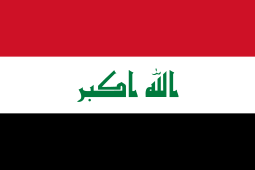 The city fell to the ISIL on 10 June 2014 after four days of clashes between the insurgents and the Iraqi military. There were reports that the group was advancing from Mosul to Kirkuk at the time. While capturing the city, the group freed nearly 1,000 prisoners, some of whom were greeted by the fighters. Black flags were also flown over government buildings. On 11 June, ISIL insurgents entered the oil refinery town of Baiji, seizing and setting its main courthouse and police station on fire. The militants, who were travelling in a group of around 60 vehicles, also took control of the Baiji prison and freed all the inmates within. Local residents told members of the media that ISIL sent a group of local tribal chiefs ahead of them, trying to convince the 250 guards at the oil plant to withdraw. Soldiers and police were also warned to leave the area. Al Jazeera claimed that later that day, militants retreated from Baiji after reinforcements from the Iraqi Army's Fourth Armored Division arrived in the city. That day, ISIL members also seized the Turkish consulate in Mosul, kidnapping 49 Turkish employees, including the Consul General, three children, and several members of the Turkish Special Forces. Reports suggested that the abducted were taken to a nearby militant base and were unharmed. An unnamed Turkish official confirmed that the government was in contact with ISIL. Prime Minister Recep Tayyip Erdoğan held an emergency meeting with members of the National Intelligence Agency (MIT) and Deputy Prime Minister Beşir Atalay to discuss the situation. The attack came a day after 28 Turkish truck drivers were abducted by militants while delivering fuel to a power plant in Mosul. Insurgents took full control of Tikrit, the hometown of former president Saddam Hussein and the second provincial capital to fall in two days, on the evening of 11 June. Local officials reported that checkpoints had been set up around the city, and that at least 300 inmates had been freed from the city's prisons, many of them serving sentences under terrorism charges. In response to the Fall of Mosul and its aftermath, the Iraqi government said that it would arm its civilians and its parliament would declare a state of emergency. The government also spoke of a plan to reorganize its military, involving a collaboration between tribal people and the U.S. military. United States of America: The U.S. State Department said that it was "deeply concerned", and felt that the situation was "extremely serious". Their spokesman Jen Psaki said, "This growing threat exemplifies the need for Iraqis from all communities to work together to confront this common enemy and isolate these militant groups from the broader population". Iraq: Usama al-Nujayfi, a speaker of the Parliament, who hails from Mosul said that "what happened is a disaster by any standard". He also criticized the "negligence" of the army as they withdrew from the city. Prime Minister Nuri Kamal al-Maliki, also asked for "help" from "friendly governments". A Mosul-based businessman commented that the "city fell like a plane without an engine" as "they were firing their weapons into the air, but no one was shooting at them". One officer told Reuters that "they [ISIL militants] appear, strike and disappear in seconds". ↑ "Mosul Falls, Indie Oil Should Rise". Forbes. Retrieved 11 June 2014. ↑ Al-Salhy, Suadad; Fahim, Kareem. "Sunni Militants Drive Iraqi Army Out of Mosul". New York Times. Retrieved 10 June 2014. 1 2 3 4 5 "Mosul falls to militants, Iraqi forces flee northern city". Reuters. Retrieved 17 April 2015. ↑ Hassan Hassan. "Political reform in Iraq will stem the rise of Islamists". The National. Retrieved 4 February 2015. 1 2 "Iraq army capitulates to Isis militants in four cities". The Guardian. 11 June 2014. Retrieved 11 June 2014. ↑ "Battle for Mosul: Critical test ahead for Iraq". BBC. 11 June 2014. Retrieved 11 June 2014. 1 2 3 4 5 "Isis insurgents seize control of Iraqi city of Mosul". The Guardian. Retrieved 17 April 2015. ↑ "'2,300 Humvees in Mosul alone': Iraq reveals number of US arms falling into ISIS hands". RT. June 1, 2015. Retrieved June 1, 2015. ↑ "Insurgents fight Iraqi forces in city of Mosul". Reuters. 6 June 2014. ↑ "80 killed in Iraq as security forces re-take city of Samarra". Xinhua. 5 June 2014. ↑ "Une province irakienne entière aux mains des jihadistes". Liberation. AFP. 10 June 2014. Retrieved 10 June 2014. 1 2 Fahim, Kareem; Al-Salhy, Suadad (10 June 2014). "Sunni Militants Drive Iraqi Army Out of Mosul". The New York Times. Retrieved 10 June 2014. ↑ "Revealed: the Islamic State 'cabinet', from finance minister to suicide bomb deployer". Telegraph. 9 July 2014. Retrieved 4 February 2015. ↑ "Iraq Update #42: Al-Qaeda in Iraq Patrols Fallujah; Aims for Ramadi, Mosul, Baghdad". Institute for the Study of War. Retrieved 5 January 2014. 1 2 3 4 5 "Special report - How Mosul fell: An Iraqi general disputes Baghdad's story". Reuters. Retrieved 17 April 2015. ↑ "Revealed: the Islamic State 'cabinet', from finance minister to suicide bomb deployer". The Telegraph. Retrieved 17 April 2015. ↑ Brown, Hayes (2014-06-11). "Half A Million Iraqi Refugees Added To An Already Overburdened Region". Think Progress. Center for American Progress Action Fund. Retrieved 2015-08-14. 1 2 "Insurgents fight Iraqi forces in city of Mosul". Reuters. Retrieved 17 April 2015. ↑ "Terror's new headquarters". Economist. Retrieved 17 April 2015. ↑ "Bombing of PUK HQ in Diyala leaves 18 dead". Daily Star. Retrieved 17 April 2015. ↑ "Iraq crisis: ISIS militants push towards Baghdad -June 13 as it happened". The Telegraph. Retrieved 17 April 2015. 1 2 3 "Iraqi city of Mosul falls to jihadists". CBS News. Retrieved 17 April 2015. ↑ Sly, Liz; Ramadan, Ahmed (10 June 2014). "Insurgents seize Iraqi city of Mosul as troops flee". The Washington Post. Retrieved 10 June 2014. 1 2 "Sunni Militants Drive Iraqi Army Out of Mosul". New York Times. Retrieved 17 April 2015. ↑ "Half a million flee unrest in Iraq's Mosul". Al Jazeera. 11 June 2014. Retrieved 11 June 2014. ↑ "Al-Qaeda splinter group captures Iraqi oil refinery town". CBC News. 11 June 2014. Retrieved 11 June 2014. 1 2 "Iraqi city of Tikrit falls to ISIL fighters". Al Jazeera. 11 June 2014. Retrieved 11 June 2014. ↑ "ISIL fighters seize 48 Turks at consulate in Iraq's Mosul". Today's Zaman. 11 June 2014. Retrieved 11 June 2014. ↑ "ISIL kidnaps Turkish consul, special forces, children in northern Iraqi hotspot". Hurriyet Daily News. June 11, 2014. ↑ "Insurgents overrun parts of Iraqi city of Tikrit". Trust.org. Reuters. 11 June 2014. Retrieved 11 June 2014. ↑ "Iraq's Tikrit falls to militants: police". Daily Star Lebanon. 11 June 2014. Retrieved 11 June 2014.